Man Repeller and H&M have gotten involved with Bloglovin' to give all of us bloggers the chance of a lifetime: receive one-on-one Mentorship from the queen Leandra Medine as well as travelling to New York to see the latest H&M Studio collection and admittance to the Bloglovin' Awards during NYFW in September! Anyways, when I saw these raw hem Kick Flares hanging in H&M I instantly fell in love; I tried them on, bought them instantly and have been wanting to style them for you guys for so long (I featured them in my "February Loves" post as well). 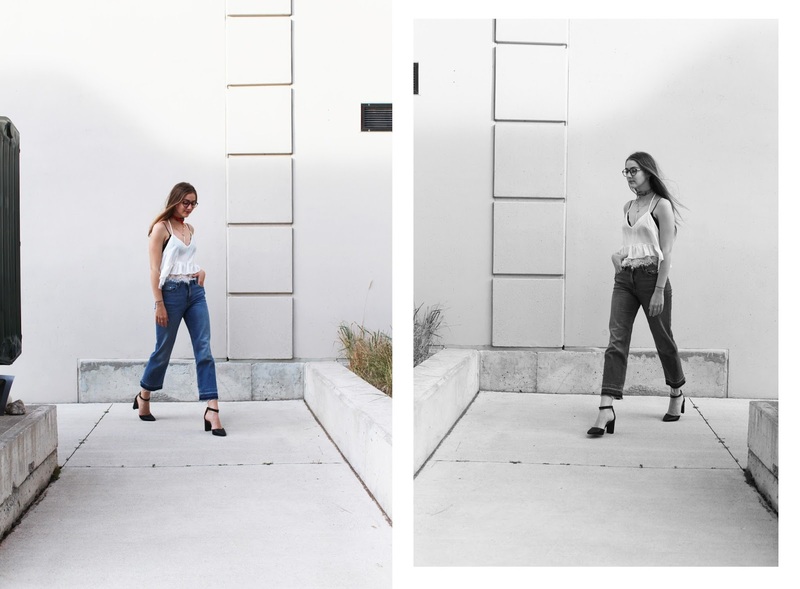 They are perfect for cool summer nights on the beach with some sliders and a big sweater, or styled like how I have done in the photos above! This outfit was perfect to wear in this silly Canadian weather that really can't make up its mind, when it's not hot but not cold either. 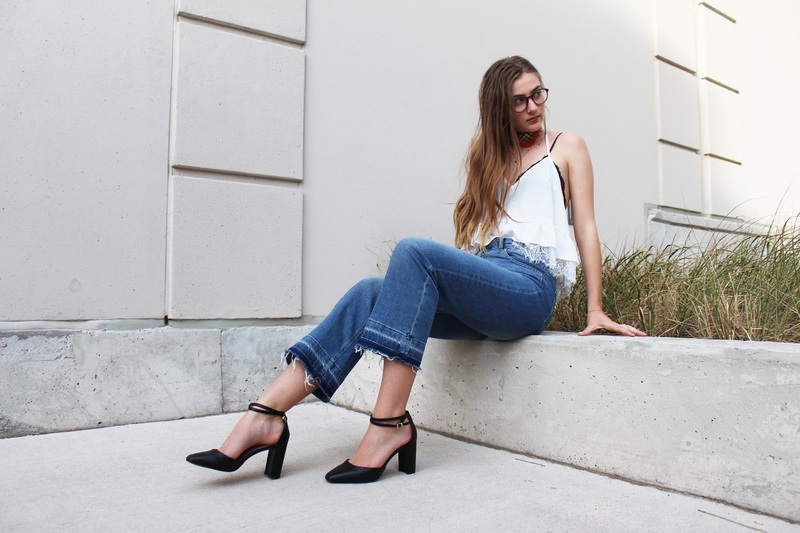 I paired the jeans with some amazing heels from H&M as well and added this flowing, eyelash lace top that brings in hints of the ruffle trend for a touch of femininity. This is the second outfit featuring one of the chokers I showcased in my "Favourite Choker Styles" post, so if you haven't read it click here to find it! There has been so much in my life that really lead up to me starting to blog. When I was in 8th grade my best friend and I spent hours and hours jumping into the HTML of our Tumblr themes and editing them to the point that they were our creations. And even before that, in grade 5 or something, I remember editing my Piczo website so much that I never even got around to adding any of my friends on it. I definitely have spent DAYS editing this blog now and its amazing to see the parallels between who I am now and my former self. Especially with fashion. When I first entered high school that's when my love for style kind of blew up; I was a lot less laid back in a way because I was still scared of what people would think of me. None the less, I pulled through and bought my first pair of Blackmilk leggings... the red galaxy ones. I was so inspired by those Californian girls on Tumblr that had long hair and galaxies on their legs that I felt like I needed to dive into that trend too, and when I did the people at my school really thought I had the most unique style. During grade 10 and onward, everyone called me a "hipster" and I hated it (and kind of loved it) because of the way I dressed. Now though when I look back to it, I was really just pulling out the trends of the time that other people didn't even know about and I did only because I was always scrolling through my Tumblr dashboard. I thank Tumblr for always inspiring me now and even back then when I had no sense of my own style, I had something I could base "cool" outfits on. One of my first outfit photoshoots with my two best friends still of today! Definitely some things haven't changed, but that hair grew out really quickly. Another throwback Haylie outfit. 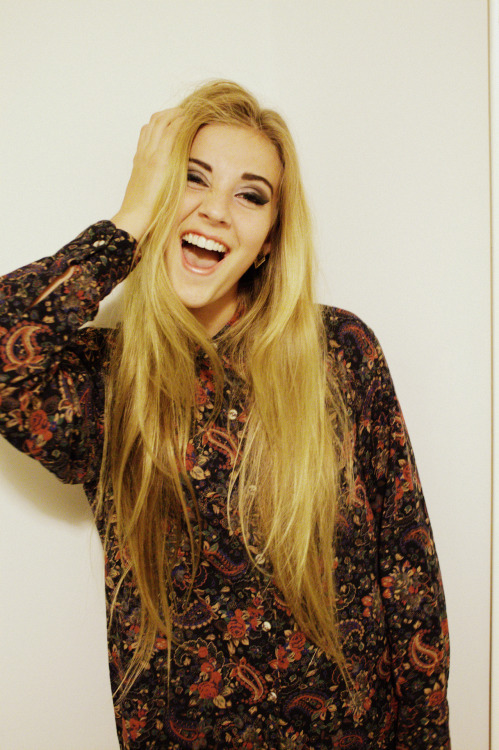 This exact picture got over 17000 notes on Tumblr.. look at that smokey eye.